Villa Oceane is a two-level vacation residence which is quite boxy in design but absolutely out-of-the-box in its overall architecture. The second level takes on the form of a long rectangular box with a wooden exterior in contrast to the predominantly white color scheme of the first level. The upper level is also slightly angled – disrupting symmetry. This unorthodox approach creates an avant garde class for Villa Oceane that is truly its own. The villa has three bedrooms. The ground floor bedroom opens out to a balcony overlooking the swimming pool. Two other bedrooms are on the second floor. One of these bedrooms opens out to a small balcony with spectacular seaside views. 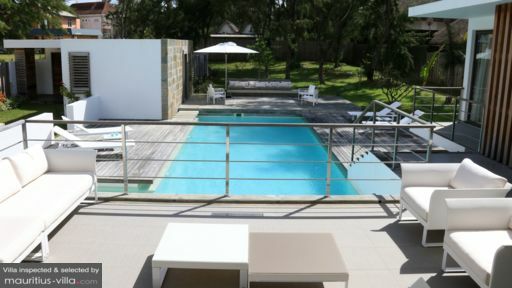 It also has a large balcony that looks out to the swimming pool area. Inversely, the other bedroom opens out to a large balcony with a panoramic view of the ocean. It also has a small balcony that looks out to the swimming pool area. All bedrooms have double beds and ensuite bathrooms. At the center of the property’s enclosed garden is the swimming pool. Jump in and do your thing – short routine laps or a leisurely dip. Around the pool is a wooden deck with many spots where you can choose to lounge on pool beds out in the sun or on a naturally shady area, or on couches and chairs under the trees by the edge of the garden or on the elevated, semi-covered terrace extending from the villa. Set up at one end of the minimalist, spacious and breezy indoors is the living area. Here, on the long cushioned couches and chairs, you can all converge – to converse or to catch your favorite show on the widescreen TV. Close to the stairway that divides the indoor space is the dining area. On the long, glass dining table good for eight, you can serve culinary specialties which you conveniently cooked at the fully-equipped, ultra-modern kitchen. A counter next to the kitchen can accommodate four more diners. One side of the ground floor indoor space opens out to the semi-covered terrace and the swimming pool area. 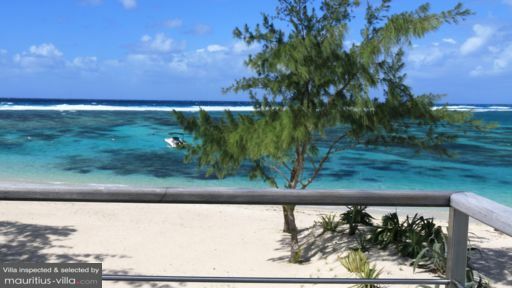 The other side has direct access to the white-sand beach of the Trou d’eau Douce Lagoon. Overseeing the regular maintenance of the villa is an in-house staff. Car rental, day tours and spa services may, upon your request, be arranged. These, however, will be charged separately. 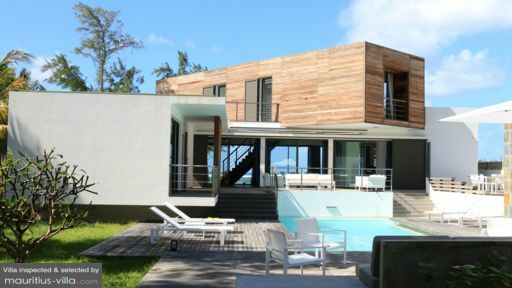 Villa Oceane is located along Trou d’eau Douce Beach at the eastern part of Mauritius. Quite melancholy and quite sleepy with its quiet, yet mesmerizing, blue waters, Trou d’eau Douce or “sweet water hole” is the tourist hub on this side of the island. It’s the jump off point to the must-see beaches of Ile Aux Cerf as well as to the scenic Quatre Cocos District towards the north. Other attractions include the actual Trou d’eau Douce – the natural spring for which the seaside town was named after. And Victoria 1840 – an old sugar mill transformed into an art gallery. However, you can only view the works displayed if you dine at the gallery’s restaurant – Le Cafe Des Arts.